Product prices and availability are accurate as of 2019-04-02 11:06:57 EDT and are subject to change. Any price and availability information displayed on http://www.amazon.com/ at the time of purchase will apply to the purchase of this product. 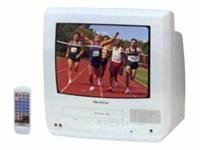 A one-stop solution is what Quasar's 13-inch color TV with 2-head VCR is all about. On this white combo model VV-1310W, you'll be able to watch your favorite programs and play your favorite VHS movies. Provides great entertainment for the family, especially in a child's room (to play games and watch movies), kitchen, or for class room training. It features a built-in 181-Channel Auto-set Quartz Tuner, front A/V input jacks for easily hooking up a DVD player or a video game console system, camcorders, digital cameras or other video accessories. It also has a headphone mini-jack for private listening. The VCR features 1-Year/8-Event Programmable Timer, Auto Clock Setting, Auto Power On & Off, Wake-Up/Sleep Timer, Digital Auto Tracking, High Quality (HQ) Picture Technology featuring a built-in detail enhancer used to boost the recorded signal and provide maximum picture quality during playback, One-Touch Timer Recording, Closed Caption System, Auto Repeat Play Capability which can be use for trade shows, Auto Rewind, Time Search, Zero Return, Commercial Skip, Tri-Lingual On-Screen Menu Display (English / Spanish / French) and V-Chip Parental Control Technology. This unit includes an infrared remote control with batteries. You'll also receive a new BLANK VHS TAPE to record programs and a MOVIE BONUS of 12 pre-owned VHS tapes for children.